The house is right on Oriental Parade and has some cooking facilities. Great location & briliant view overlooking the harbour from the open planned lounge & dining area, as well as from the main room. The decore was fun e.g. origami swans. The location and view! The beds were so comfortable, a little apartment was great for just a night out! Location was great, we had 5 adults fit in comfortably, The owners were very easy to contact. Recommended for a city stay in wellington. Comfy beds ,location to beach ,city ,activities . Had every thing required in flat for a weekend away . Great location. Fast, free wifi. 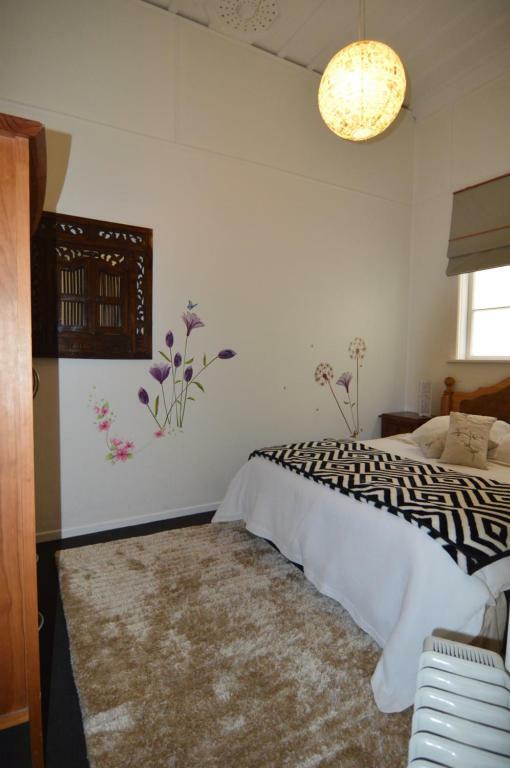 Lovely high ceilings, boutique traditional Wellington flat. Bright and light. Washer and dryer, and washing powder provided. Very comfortable beds. The near city location is the best part of this accommodation, although it is located on a very noisy road. Facilities are basic but adequate. Two double beds and a sofa bed but it would be very squeezy to use the sofa bed in the living room/kitchen. The location for walking into Wellington was fantastic. Close to Te Papa Museum (excellent) and Cuba St restaurants. The beach was right across the road. The apartment had all the basics and the owner met us promptly with keys and a tour around the apartment. Lock in a great price for Private Beach House – rated 8.4 by recent guests! 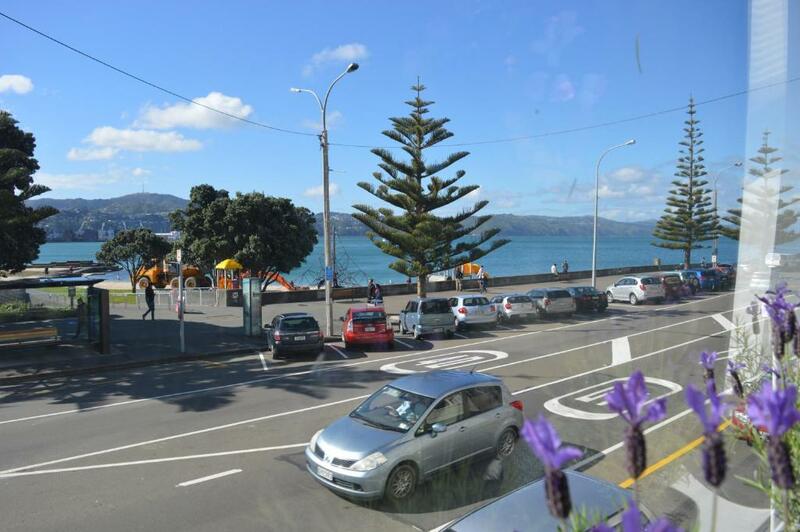 Featuring sea views, Private Beach House is located in Wellington, an 11-minute walk from Te Papa. Guests staying at this vacation home can use the free WiFi and a fully equipped kitchenette. The vacation home features a flat-screen TV and a living room. Private parking is available at the vacation home. Cuba Street is 0.9 miles from Private Beach House, while TSB Bank Arena is 1.1 miles from the property. Wellington Airport is 5 miles away. When would you like to stay at Private Beach House? This holiday home has a oven, tumble dryer and kitchenware. Private parking is available on site (reservation is needed) and costs NZD 10 per day. The place has great views and only a few minutes walk to the beach, restaurants, nightlife and the city centre. The place is quite peaceful at night. I am a very friendly and outgoing. I have fast responses and am quite relaxed. I love the beach and the sun which is what makes this place a great place to stay! A big public gym with spas and swimming pools is just across the road from the house. You’ll love my place because of the view, the light and the location. My place is good for couples, business travelers, families (with kids), and big groups. House Rules Private Beach House takes special requests – add in the next step! A NZD100 damage deposit is required 7 days before arrival (about USD66.41). This deposit will be fully refunded 7 days after check-out, as long as there isn't any damage to the property. Private Beach House accepts these cards and reserves the right to temporarily hold an amount prior to arrival. A damage deposit of NZD 100 is required. The host charges this 7 days before arrival. That's about 66.41USD. This will be collected by bank transfer. You should be reimbursed within 7 days of check-out. Your deposit will be refunded in full by bank transfer, subject to an inspection of the property. 1. Was in the filter for 3 bedrooms however it only had 2 bedrooms & the bed for the 5th person is the pull out coach, which I didn't expect (especially as the filter was 3 bedrooms) finding this upon arrival. 2. The bathroom floor & shower was dirty/ not cleaned when we arrived. 3. Upon booking - not including the $100 deposit - the price shot up from what the origional price said! The house was a bit dated, some items wrapped in plastic (TV remote and table), very little worktop. Location, nice and clean, provided a good range of useful items. Washing machine and tumble dryer available. Beach and Nice coffee shop across the road. The house was very old and dated! Nothing to what we expected from the description of the property. It is not a beach house at all. It is just an apartment that needs love! NO parking at this property either. Clean and beautifully decorated, great location! Noise of traffic at night and very late ,early morning revellers on beach and play ground . The random left over food in the fridge and kitchen. Tea and coffee, ok, but the notice encouraging use of left overs is a bit creepy. I wouldn’t eat or drink other people’s leftovers. The plastic coated coffee table just felt offensive. The laminated notices everywhere would be better in a folder on the table. Seem cheap and hostel-like. The vibe of what could be very luxurious apartment is also spoiled a bit by being too quirky and personalised to the owner or former tenant. Replace the Origami cranes in the living room, hippy mural in the back bedroom, 70s kitchen animal art on the walls, blue mosaic faux tile wallpaper in the bathroom with a neutral, elegant colour scheme/ paint job, matching bedding, and then this property would match its price point. Th owner came quickly when I got through and was quite helpful and friendly but doesn’t have voicemail so I just got a busy signal for ages when trying to get in touch. Apartment was very musty smelling when we arrived. No air-conditioning and the rooms facing the road get a lot of afternoon sun. Very basic facilities and no dishwasher. The apartment was attractive to us for it's location and views. However the lovely picture windows were not very clean inside and out, obscuring the lovely views of the harbour.